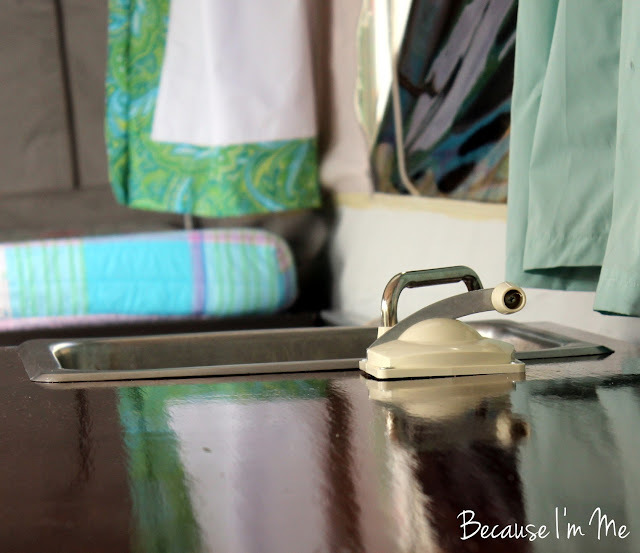 Round 1: primed and painted all cabinets and inside "walls", changed out knobs to clear, added bed covers. 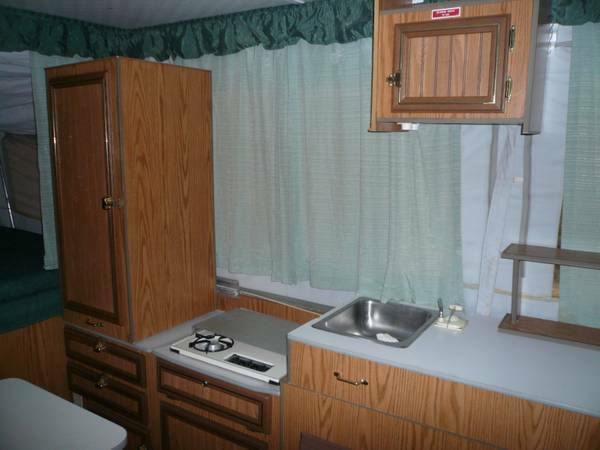 Round 2: replaced counters and kitchen table, replaced faucet, added "wood" floors, beginning of replacing curtains. I'd hoped to take "pretty" pictures with a nice nature background on our most recent camping trip. But it rained. And rained. And rained. I couldn't open up the camper at all and only took one picture on the trip - and that was of a bunch of clothes and towels hanging from the ceiling to dry, wet from trying to keep the numerous leaks from soaking the beds (it didn't work). The sink faucet started leaking during our summer trip and ruined the counter it was on. The counter was cheap particleboard type stuff with a laminate cover in light gray, so it wasn't heartbreaking to see it go. I replaced both the faucet and the counter, with wonderful neighbors cutting the counter wood for me. Sometime in the last few weeks I did buy my first real power saw, a jigsaw, and while it scares the crap out of me it's a whole lot of fun to use - very empowering - but these cuts needed to be "right", so I left that to much more experienced experts, some of whom were bribed to help with cookies (they're great people and would have done it anyway, I like making cookies). While replacing the sink counter I chose to replace the counter behind the dining table as well as the dining table itself. I used 1/2" pine for the counters and 3/4" pine for the table. I opted to save time and money and use a stainer/polyurethane combination for the wood. Were I to do it again I'd use separate stain and polyurethane, giving me more control over the color without brushing on so many coats of polyurethane (lesson learned). I chose to add a few inches in length to the dining table since there are so many of us eating at it. I was a little concerned as that would limit aisle room, but it hasn't been noticeable at all. The "wood" floor is peel and stick planks from Lowe's. Very simple solution to that problem. The tiles only took about 2 hours, total, to install and they're thin enough to not add much weight to the camper. The hardest parts were that (1) it really is a one person job just because of the space limitations and (2) measuring for the cuts (which were done with kitchen scissors) required a lot of moving around because the L-square I was using was huge. The end curtains are white light blocking curtains with a green-blue paisley cotton trim. White curtains and kids ... hmm. I knew I wanted the opening and closing portions to not be white, thus the print going up the center. 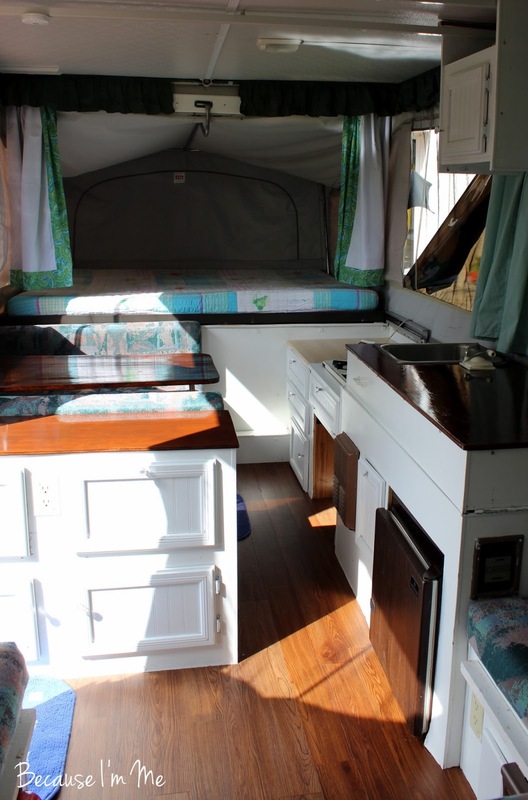 The light-blocking gives a little privacy to the kids for changing clothes and also keeps the heat in the bunks during the day, instead of it overheating the main part of the camper. 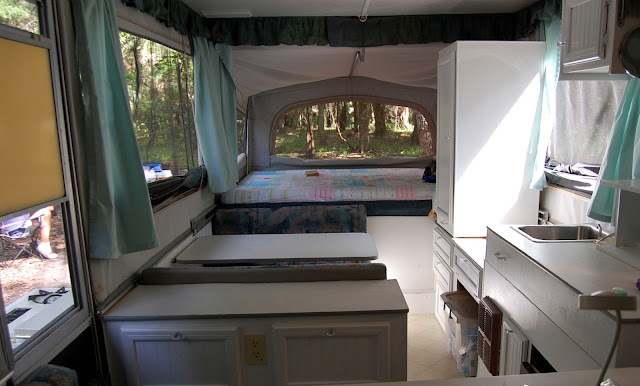 If the AC is running and those curtains are closed the camper gets cooler than it would with the ends exposed, and the heat really does stay in the bunks - I'm not sure what the temperature difference is between the bunks and the camper but it is quite significant. To create the curtains I purchased one package of long light blocking white liners. I removed the hem and side seams and cut the curtains in half across the middle. I attached the needed amount of paisley to the center insides, then to the bottom, hemming the curtains when they were put together. With a seam ripper I removed the tabs from the previous curtains and stitched them to the tops of my new curtains, evenly spacing them. They were super easy to stitch through, the machine didn't even notice them. 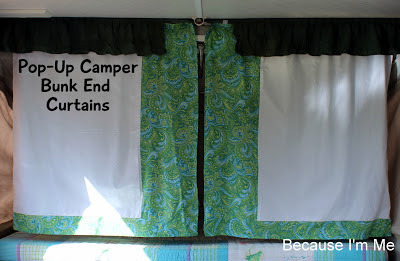 The curtains around the camper, coming soon, will replace the seafoam green curtains and will be white cotton with the same paisley fabric along the bottom. The green valance around the top will be removed and replaced with ?? - not quite sure yet. Yes, the cushions, seafoam green curtains, and valance have to go! The cushions have not yet been replaced, but I'm leaning towards a navy with bits of white canvas. The further I get with the rest of the projects the more unavoidable the need to replace those cushions is! There are still plenty of "nuts and bolts" mechanical issues to deal with, a few leaks here and there, some rotted wood to replace, and a list a mile long of other little troubles. It's a bit therapeutic to break up those tasks with some of the fun "decorating" projects. I'd been shopping for a step cover but they ran about $20, so I went to WalMart and bought a cheap, small doormat and a box of cable ties, spending less than $5. I cut the doormat in half and wrapped it around my existing step, securing it on both ends with the cable ties. I have plenty of extra cable ties and another half a mat so I've got another cover ready to go and can replace the ties if they break (they do, the ones on the left side of the step are currently missing). 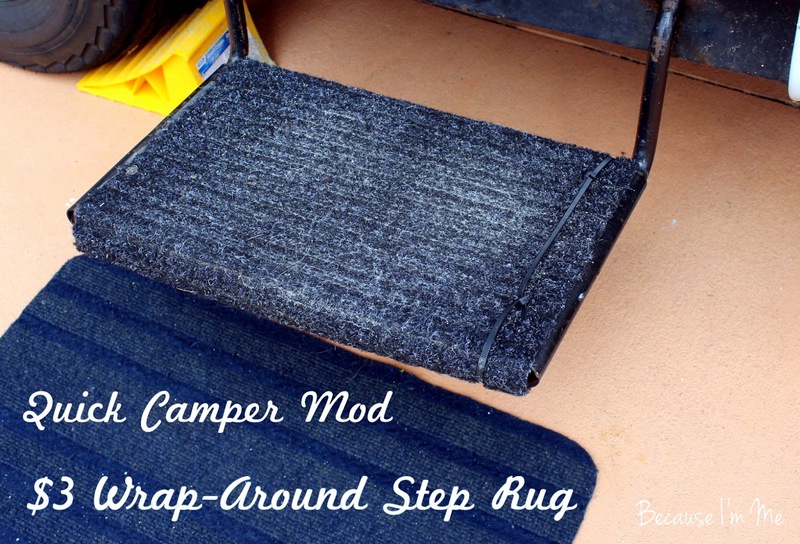 The mat helps immensely to cut down on the dirt/sand/gravel that comes into the camper and can be quickly swept with a broom. Cost per step cover: less than $3. Backing up the camper has gotten much easier. It still doesn't always do what I want it to but I'm getting it where I want it more quickly and with fewer "tries". I had to parallel park my minivan the other night, which I've never been good at. But after all the practice backing up and moving forward with the camper a little parallel parking was a piece of cake. Skills, I tell ya. this is a great post full of excellent ideas! Thanks for taking the time to share. Our popup is new but lacks "personality". Of course, husband thinks it is fine the way it is, but eventually it will need updating! You've given me ideas to start with. Thanks! Yes, I did, and cut it with scissors ... Super easy! 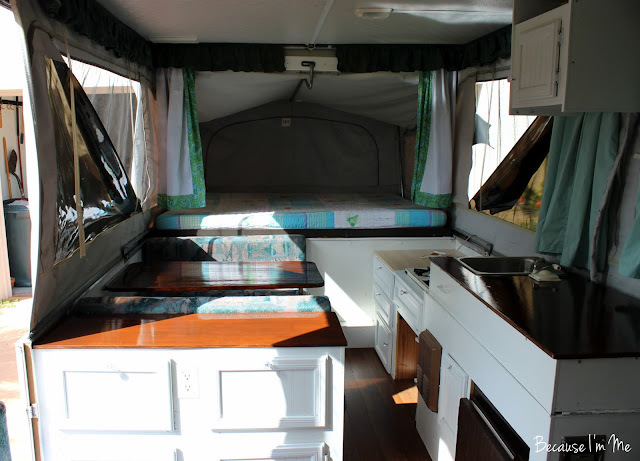 My camper came without any curtains so I have no idea what plastic peices are needed to make the curtains hang or how many - anyway you could send me some closeup pictures of the slides for the curtains and privacy panels? 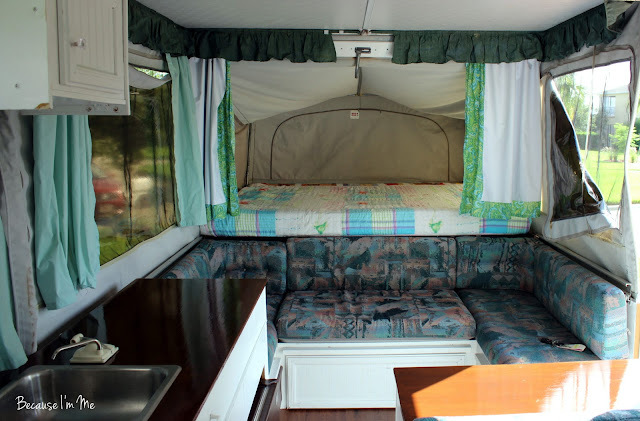 I just purchased a camper and it didnt have any of the curtians or original "curtain Hardware" Im at a loss trying to figure out what i should use- any chance you could send me some close ups and give me an idea the number of clips i might need? Does your camper have the tracks that the curtains clips go into? I can take some pictures for you this morning and then we'll figure out how to get the pictures to you! Different campers use different clips or runners in the tracks ... I'd say I used about 10 in each curtain, but that's a guess since my camper is in the garage and not set up (this is a sad thing!). One of the best places to look for info is the message boards on popupportal.com ... I find all sorts of great info there! I used Velcro strips. Very inexpensive at dollar store. Bought shower curtain and cut the length for bunk. what was left I made valances..
Did you use the full 2 boxes of flooring?